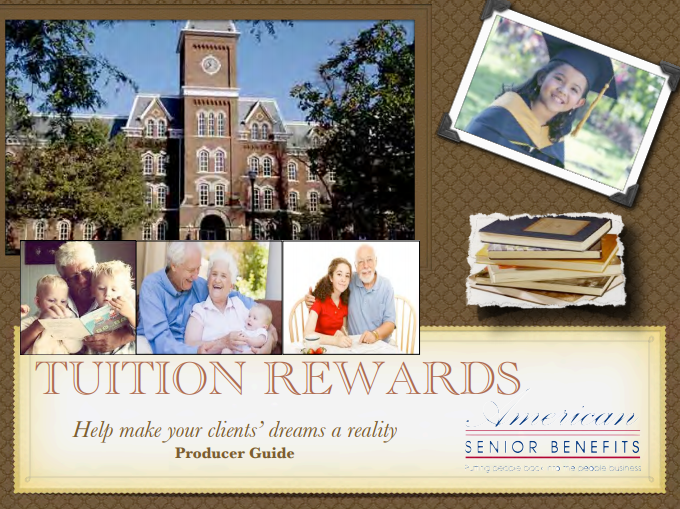 What is Tuition Rewards ? It is a private college scholarship program offered in connection with fixed and fixed-indexed Annuities, cash value Life Insurance Policies, Long Term Care and Medicare Supplements offered through American Senior Benefits. Tuition Rewards offers a scholarship for up to one full year of tuition per designated related student at participating colleges. Tuition Rewards generally count as part of their normal institutional and merit scholarships. Through your eligible plans, you earn points toward a private college fund for future generations.